John F. Harvard was born in Chicago, IL on May 14, 1929 and passed away on March 20, 2019 at the age of 89 at his home in Naperville, surrounded by his family. John attended SS Peter and Paul Grade School in Naperville and went on to graduate from Naperville High School - Class of 1947. He was the Vice President of his class and was a loyal Redskin (now the Redhawks) lettering in football, basketball, and track. His best event was the high hurdles. His enrollment at the Univ. of Illinois - Champaign/Urbana was delayed a semester having contracted Polio upon high school graduation resulting in life-long leg paralysis. 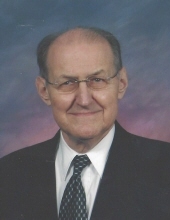 John graduated from the U of I in 1952 with a degree in Industrial Administration. He was on the Dean’s list and was the President of the Kappa Sigma fraternity. He was a lifelong Illini fan. Right after graduation John began his career in Industrial Sales with United States Gypsum Company in Chicago. He moved around for the next 38 years from Minneapolis, Detroit, and back then back to Chicago where he eventually retired in 1990 as National Accounts Manager. He went on to work part time for Friedrich-Jones Funeral Home for 8 years in his retirement. John served on the Naperville Heritage Society Board and founded/ served on the Woods of Bailey Home Owners Association. He was a long time member of Grace Church having served on the Executive Board and Church Council and was a long time usher. Along with his wife Rita and sweet honey, they were strong supporters to many Naperville groups and causes that recognized the importance of the Naperville spirit. John was preceded in death by the love of his life for 31 years, 4 months, and 1 day - Rita Fredenhagen Harvard, his son Kent Harvard, his sisters - Adeline, Ann, and Cecelia. His survivors include his daughters Kelly (Dean) Pelland of Carol Stream, Kerry (Preston) Irwin of Bartlett, and his adopted son Thomas Castagnoli of Naperville. He was loved and affectionately called “POPPY JOHN" by numerous Grand and Great Grand Children. He always spoke of the tender kindness he received from so many people. He was deeply loved and will be forever missed. In lieu of flowers, memorials may be directed to North Central College Science Fund, 30 N. Brainard St., Naperville, IL 60540 or Naperville Heritage Society, 523 S. Webster St., Naperville, IL 60540 or Grace United Methodist Church Foundation, 300 E. Gartner Road, Naperville, IL 60540 or SS. Peter & Paul Church, 36 N. Ellsworth St., Naperville, IL 60540. Visitation will be Tuesday, March 26, 3:00 until 8:00 PM at the Friedrich-Jones Funeral Home & Cremation Services, 44 S. Mill St., Naperville, and Wednesday, March 27, 10:00 until 11:00 AM at Grace United Methodist Church, 330 E. Gartner Rd., Naperville. Funeral Services will follow at 11:00 AM. Interment will be at Naperville Cemetery. To send flowers or a remembrance gift to the family of John F. Harvard, please visit our Tribute Store. "Email Address" would like to share the life celebration of John F. Harvard. Click on the "link" to go to share a favorite memory or leave a condolence message for the family.